Stearns & Foster has been a leader in luxury mattresses for decades, the heritage of this brand goes back to 1846. Now part of the Tempur-Sealy Company, the beds are still among the best today. An entirely new designed collection launched in 2019. With their long legacy, it’s no surprise these beds are still built on traditional innerspring coils, topped with rich layers of cushioning materials. And not being stuck in the past, Stearns & Foster recently added Hybrid models (innersprings with memory foam on top.) The broad line-up ranges from firm to super-soft models at various price points. Stearns & Foster Estate Mattress Collection: The most affordable, introductory level of beds. Like all Stearns & Foster beds, these have soft TENCEL fabric covers, some Indulge Memory Foam (some models) and precision edge support. 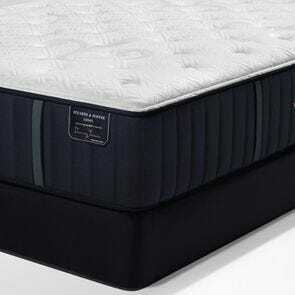 Stearns & Foster Lux Estate Mattress Collection: The mid-tier level adds premium materials IntelliCoil HD pocketed coil in coil designed innerspring, Indulge HD Memory Foam and some models begin to include a layer of micro coils. Stearns & Foster Lux Estate Hybrid Mattress Collection: Made for people wanting memory foam with traditional innerspring support. The Lux Estate mattresses are constructed with a half foam/half innerspring design for the best of both worlds. Stearns & Foster Reserve Mattress Collection: The flagship collection features extra layers of Indulge Memory Foam HD for a more luxuriously conforming feel. Top model even ads a second layer of micro coils. But with prices starting at $3899, the added benefits may not be worth the extra price unless you really want "the best". 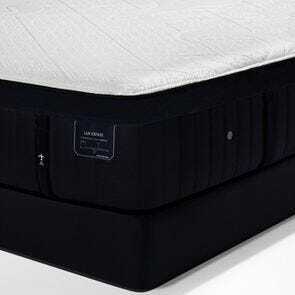 Mattress Only Height 13.5" to 15.5" 14" to 16.5" 13.5" to 15" 16" to 17"
The cover of the mattress is a stretchable fabric, and being a luxury mattress, the fabric is also nice looking and very rich and soft to the touch. The weave includes TENCEL material which helps the fabric breathe and wick moisture from the bed. The Lux Estate Hybrid and Reserve collection beds have a slightly different Prima Cool Lux Stretch Performance Fabric with TENCEL. Those covers have additional stretchable qualities to better complement and contour the mattress tops. This foam layer helps the bed conform to your body so your weight is more evenly distributed to reduce pressure points that can disrupt your sleep. It’s also engineered to respond back when you move to lessen any sinking feeling and make it easier to move and change positions. All the collections use Advanced Adapt Foam which is a type of memory foam. 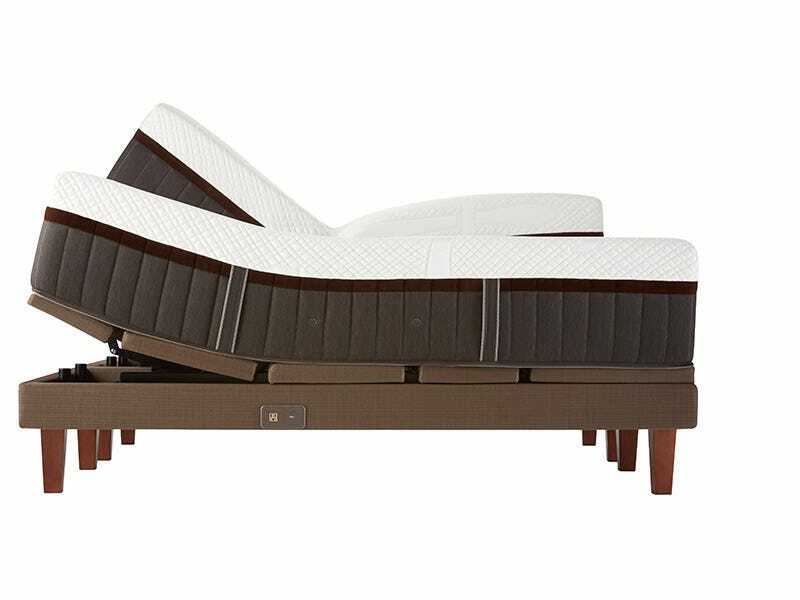 The Lux Estate Hybrid Collection uses extra thick layers of this to provide the memory foam feel. 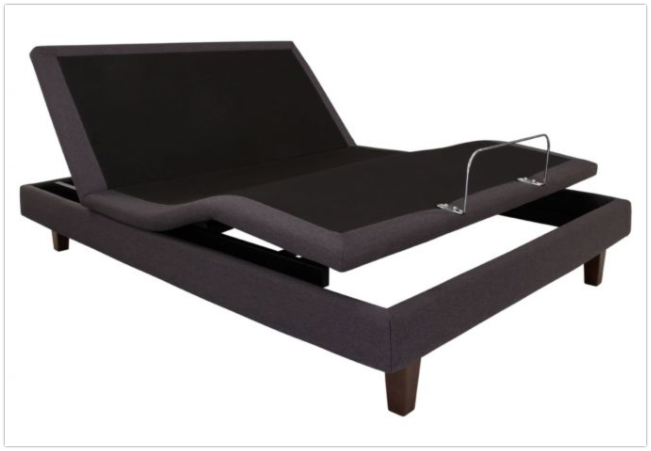 Most of the Stearns & Foster beds add another layer of gel foam to further enhance the cradling comfort of the bed. They use gel foam in this purpose to help the mattress sleep cooler, since gel foam has the ability to help pull heat away and help you sleep cooler. This is a step up from regular memory foam. The Hybrid Collection uses a slight variation of this foam. 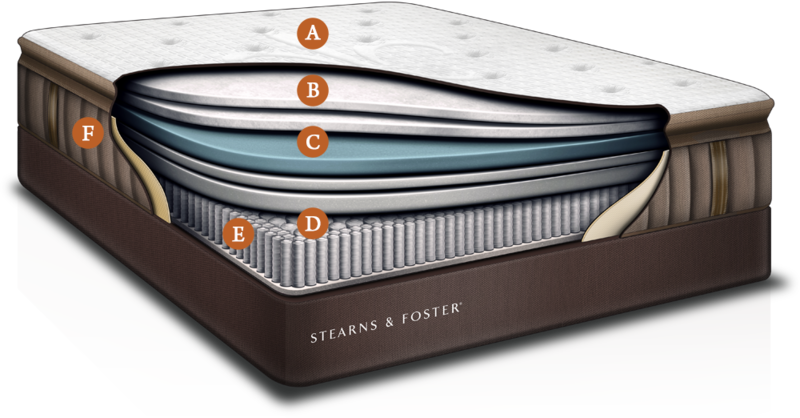 Every Stearns & Foster mattress is built with their trademark coil system to provide robust support. They use a coil-in-coil design which has a longer outer coil to contour to your body, and a much thicker coil for solid support. Overall it’s a pocketed coil system, which helps minimize motion transfer when you sleep with a partner. The coil-in-coil system is even more effective at suppressing motion transfer, another premium feature in Stearns & Foster mattresses. Most mattresses are produced with some sort of edge support which helps when you’re sitting on the edge of the bed. It also makes the entire sleeping surface more usable since you won’t roll off the edge. Stearns & Foster’s edge support design is enhanced to ensure the feel of the bed is uniform from the middle to the edge of the bed. This is a detail usually only available in premium mattresses like Stearns & Foster. Compared to all the technical materials feature names incorporated into mattresses, Air Vents are a functional, straight forward and easy to understand addition to the mattress. The air vents allow the mattress to better breathe air into and out of the mattress which better removes heat and moisture. So a simple feature like this helps you sleep cooler and better. Stearns & Foster mattresses are available in select stores and online retailers, and not from Stearns and Foster directly. These are heavier mattresses and are usually delivered by the retailer’s in-home delivery service. 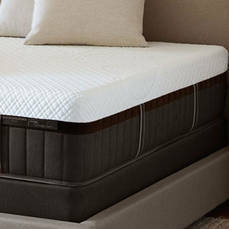 Being a premium brand, in-home delivery is typically offered for free, along with removal of an old existing mattress. Stearns & Foster has manufactured the most luxurious and lasting mattresses since 1846. Every Stearns & Foster mattress is built by certified craftsmen in a dedicated luxury cell, meaning that no other models can be built there. Additionally, every piece of material that goes into a Stearns & Foster mattress is rigorously tested to ensure top-notch durability. By constructing their mattresses out of the best materials in the industry, Stearns & Foster delivers unprecedented comfort and quality that is unmatched by other brands. 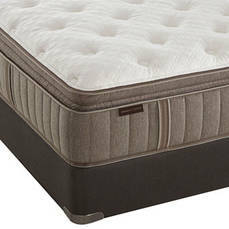 Their foam encased edge contains a border rod to provide the best edge support available, and each mattress has twice tempered, individually wrapped, titanium alloy coils that deliver the perfect balance of comfort and support. Stearns and Foster eventually became part of the Sealy Mattress Company, serving as the premium sister brand to Sealy Posturepedic. In more recent history, Tempurpedic bought Sealy and Stearns & Foster now resides in the Tempur-Sealy mattress company, based in Lexington, KY. In recent years, there has been a resurgence in the Stearns & Foster brand with sales growth coming from continued investments in the products and broad acceptance by luxury mattress buyers. Stearns and Foster is a tried and true luxury mattress brand, having a long history of dependability. The mattresses include better than average features to provide a premium quality product, to be expected with the higher prices on these mattresses. This brand sells hundreds of million dollars annually, so the mattresses have been in wide use for decades. Online review sites have mixed commentary primarily due to online consumer complaints. However, when the number of complaints is taken in context to the millions of mattresses in use, along with the brand loyalty of Stearns & Foster customers, a clearer picture is provided into this brand. 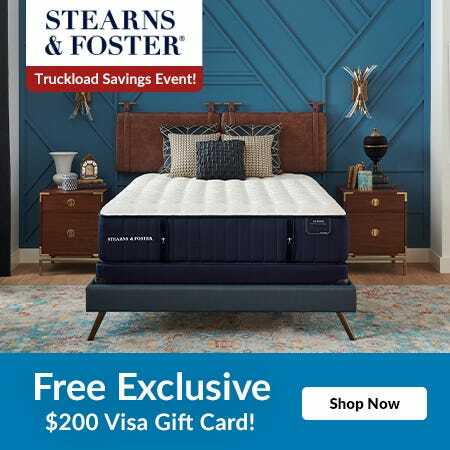 For those who can afford a more expensive mattress in order to obtain a better than average product the Stearns and Foster brand is a viable choice. For your individual decision, it’s most important to see the features, feel, and pricing that are right for you.